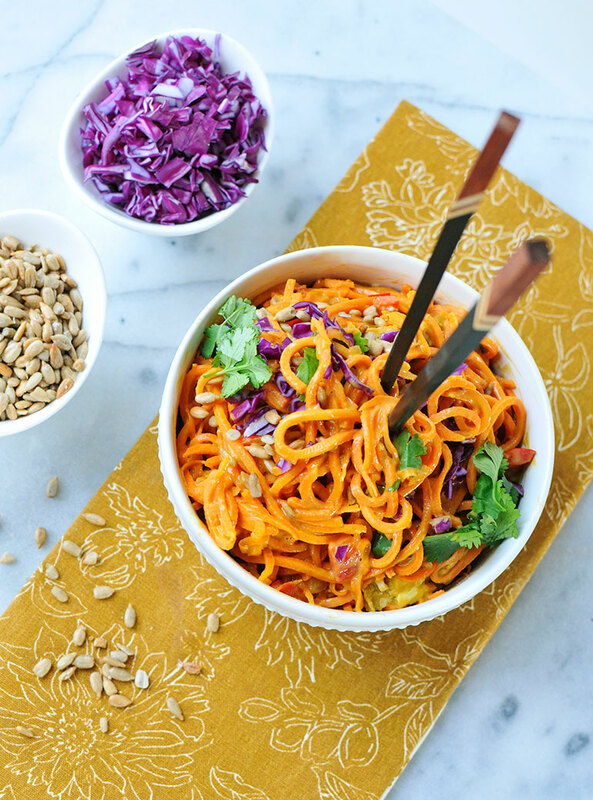 This paleo pad thai is made with sweet potato and carrot "noodles" and then topped with a delicious sunflower butter sauce and colorful toppings like egg strips, red cabbage, sprouts, bell pepper, cilantro, black sesame seeds, and sprouted sunflower seeds from Nuts.com. 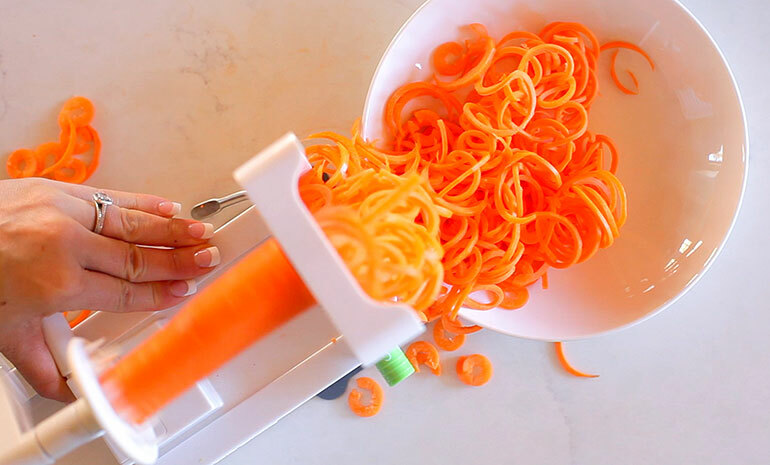 As you probably know, I LOVE my spiralizer. I've tried to convince you here and here and here and here to buy one. It might just be the best $35 you spend this year! And after you scroll through the pictures below, it will be a done deal. For the love of veggies! (here's the one I use). 1) You might have seen this over on my IG stories, but the trick to spiralizing carrots is to get the fattest carrots you can find, LOL! My grocery store sells single organic carrots in a basket, so I just hand-pick the fattest ones. 2) Make sure you when you cook the veggie noodles that you are stirring/tossing with tongs constantly. You want them to soften and get warm, but not turn into mush! It's a delicate balance. I don't know about you, but my favorite part of noodle bowls (and pho and soup and froyo... ok, anything) is the TOPPINGS! And you know I love my colors! 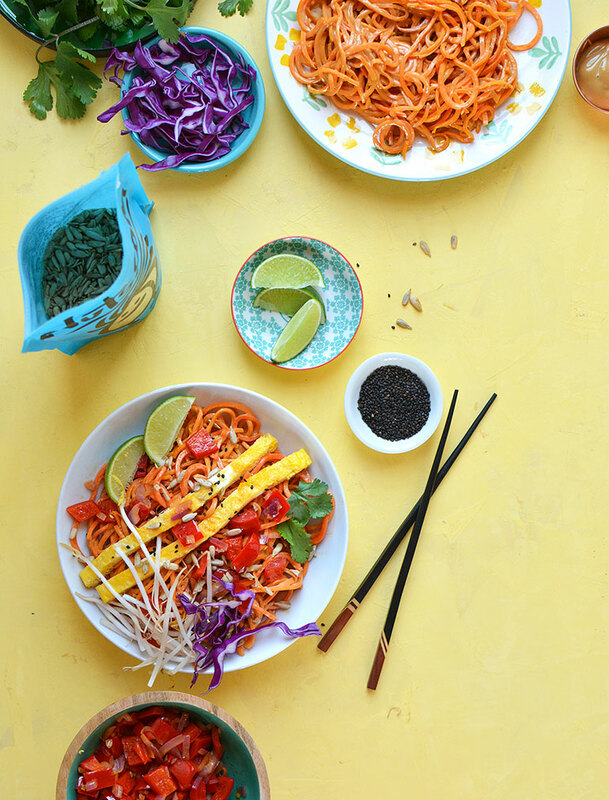 This could easily be called Rainbow Pad Thai too!! Feel free to throw in some grilled chicken or shrimp too (though it's delish as-is)! And if your family isn't quite ready to fully embrace veggie noodles... try creating a blend by subbing in 50% rice noodles. PS. This pad thai is an old family favorite from my blog and cookbook--- check out this original pic from 2014. It's so funny to look back on old pictures and see how much I've improved! Combine 1 tbsp of sesame oil with the other sauce ingredients (sunflower butter through coconut milk) in a large measuring cup. Use an immersion stick blender to puree the sauce until smooth. Set aside. Combine eggs and 2 tbsp coconut milk in a bowl and whisk until combined. Coat a 9x9 square baking pan with room-temperature (non-melted) coconut oil. Pour egg mixture into pan. Bake for 12 minutes until cooked through. Remove from oven and cut into thin strips. Set aside. 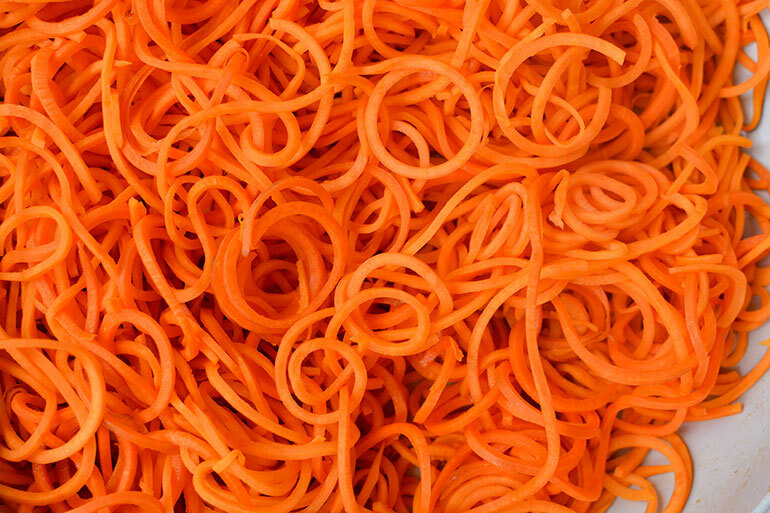 Spiralize (or julienne) the carrots and sweet potato. In a large skillet over medium-high heat, saute red bell pepper and red onion with a bit of sesame oil, until softened. Then, add in 1 tbsp of sesame oil and the spiralized noodles. Saute for approximately 12 minutes (stirring frequently), until noodles are softened but not mushy. Stir in the pad thai sauce that you previously made and set aside making sure to coat all the noodles evenly. Assemble your bowls: noodles topped with egg strips, sunflower seeds, red cabbage, sprouts, sesame seeds and cilantro.